It’s Friday! The weekend starts here and of course it’s time to crack open a beer. This is a very exciting weekend for the Bierebelle as I’ll be heading off to Swinley Forest tomorrow for a weekend of mountain biking mayhem so tonight I’ve gone for one of the lighter bottles in my modest collection. Light should not by any means equate to boring though! 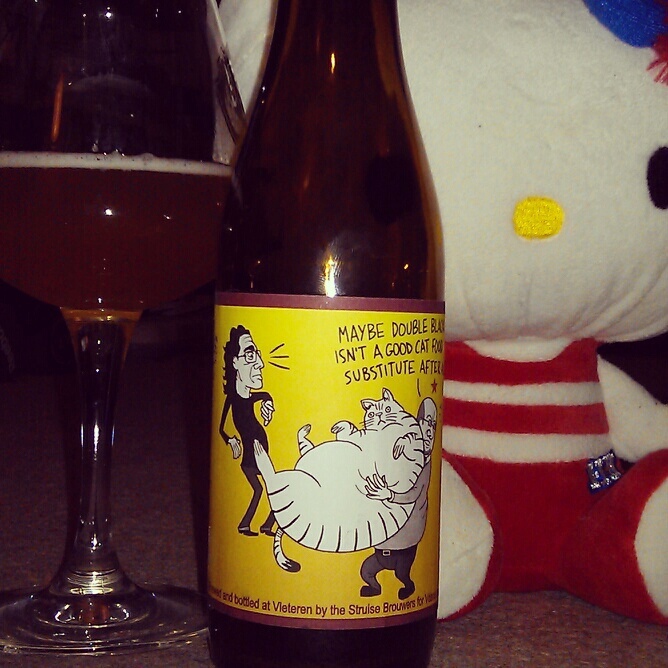 Tonight I’ve picked out a rather special beer from those amazing Belgian masters, De Struise Brouwers, Catso (5%ABV). The Sturdy Brewers sturdy cat is quite the joyful departure from the dark styles with the moody labels I’ve had from Struise in the past. Almost as a sunny counterpart to the dark Black Damnation series, this is the second of a twelve beer ‘Cartoon Series’ illustrated by Arne Frantzell (illustrator for Trouble Brewing) which will all have a blond base. The sunny yellow label depicts a comically obese mog with the caption ‘Maybe double black isn’t a good cat food substitute after all;’ perhaps they could wean it off with this light-hearted saison. Out of the bottle, it’s like a hazy sunset on a warm evening. There’s a rustic hoppy aroma with a touch of golden hay and honey sweetness. The flavour is a laid-back hop with a soft citrus sourness with a little dryness at the back and the citrus dances gently on the tongue to finish. I imagine Catso likes to spend lazy summer evenings languishing on the porch of the Struise farmhouse. Certainly a beer to keep in for when the sun finally puts in an appearance. Sadly this was from Brussels – where do I get more! ?